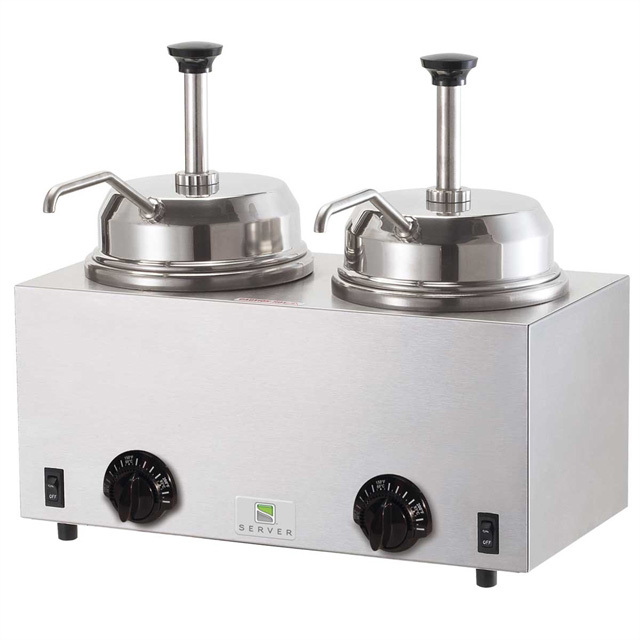 This water bath warmer is thermostatically controlled to hold two wells of product at serving temperature. It's constructed of stainless steel for durability and includes two pumps. Twin warmers feature two thermostats, for individual control, that sense food temperature and turn the 500-watt heating elements on or off as needed to eliminate burning or scorching. The TWIN FSP accepts two stainless steel jars or manufacturer's #10 cans. However, your local jurisdiction may not permit dispensing directly from a #10 can. We recommend our NSF approved stainless steel jar #94009 (see companion product below). The stainless steel pump works with fingertip ease. Plus, investment cast valve bodies and welded joints offer more corrosion resistance and durability. Maximum stroke yields a 1-oz (30 mL) serving with gauging collars provided to reduce the yield in ¼-oz (7 mL) increments.